When it comes to creating a wine tasting event, back to basics is sometimes the best way to go. As many of you know, I am often hired to conduct wine tasting events. This week, I had the opportunity to direct a tasting for the top producers of a healthcare insurance provider. It was a small tasting, for only ten people. When I was called, and asked to organize the event, they had requested a tasting that would help the employees learn more about wine, wine pairing, and wine tasting. It was left wide open for what wines, foods and total expenditure (but I was told to get "good wine"). Now normally, I try to expose people to new grape varieties they may not have tried, but this go around, I settled on more basic wines. I determined that I wanted to cover as many different styles as I could, without getting the group drunk. So, I limited it to six bottles of wine. To cover the range of styles, I decided to go with a semi-sweet/high acid wine, to start the discussion about how the palate recognizes different aspects of a wine. Riesling has both acidity and residual sugar. The second wine had to have more body, but I also wanted to generate discussion about malolactic fermentation, and the buttery oaky flavors found in wine. A California Chardonnay would do the trick here. Bridging the gap between white and red wine, I had to go with a rose. There is still that impression that roses are sweet, so a dry rose from Southern France would do the trick. When it came to the red wines, I knew I needed to go with a lighter red, and a heavy red, but also wanted to have wines that emphasized fruit, and some that emphasized earthiness (or terrior). Additionally, I wanted to share an aged red, to generate discussion about aroma versus bouquet. In an effort to keep the group from being influenced by the wine label, I put all the wines in bags, and revealed the wine after each one was tasted. Now that I had my wines figured out, I had to come up with some food pairings that would work with the wines. Obviously, not everything works with every wine. I knew I wanted to do at least three cheeses, so went with one soft cheese (Brie), one medium cheese (Gouda) and ended up with two hard cheeses (Mimolette and Manchego). The two hard cheeses were different, in that the Mimolette was aged, and the Manchego was only aged three months. 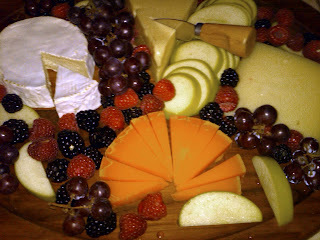 To the cheese platter, I added tart fruit, red fruit, dark fruit (green apples, raspberries, blackberries and red grapes). The second platter was my meat tray. I wanted to do a fatty meat, a smoked meat, and a salty meat. I chose a salami from a local producer for my fatty meat, and decided to go with a smoked salmon for the smoky meat. The salty meat was prosciutto. 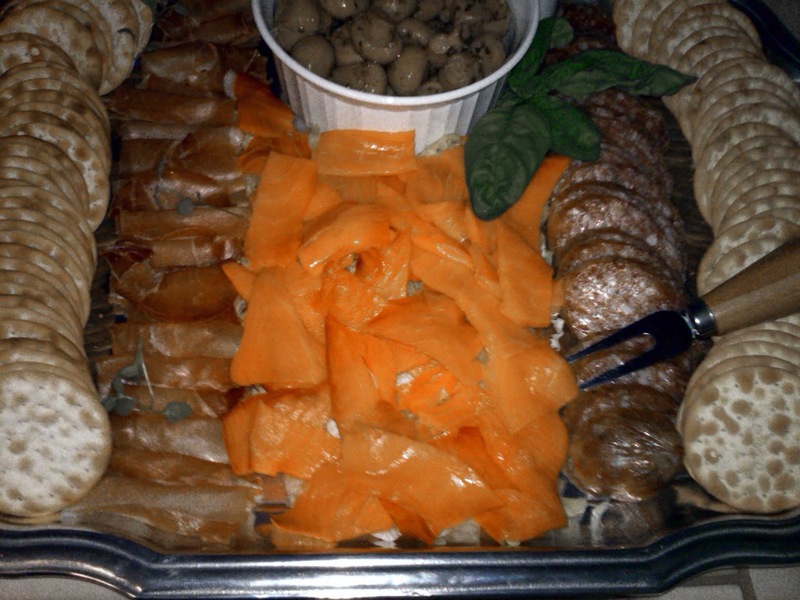 To this tray, I added some marinated mushrooms and water crackers. Each tray had a purpose. The idea was to see what worked with which wines. A good example was how an oaky chardonnay worked with marinated mushrooms (with garlic). What do you think would happen if you took vanilla and mixed it with garlic? Not the best pairing, but it is part of learning why certain styles of wine work better than others with different foods. With a larger group, I would add three more wines to the mix. I think a nice example of sparkling wine, and two examples of a fortified wine (probably a Port and a dry Sherry) would really add to the understanding of the different styles of wine. 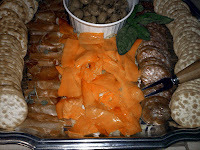 By adding those extra wines, I would add some green olives to the platter, maybe some shrimp, and definitely milk chocolate and bitter chocolate (to emphasize that sweetness of the wine, versus the sweetness of the food). It was fun evening, with a lot of discussion, and, based on the comments, people really enjoyed the tasting, while learning something new about wine. We talked about ordering in restaurants, and wine stores, and how learning just a few new terms, and tasting techniques, can really make a difference in your appreciation of wine. I hope you will use this tasting example, and try putting together your own event. 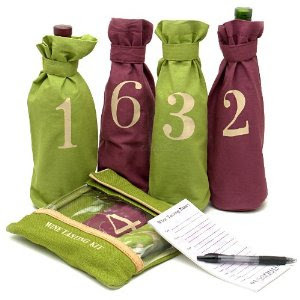 If you'd like a Sommelier there to guide your through the process...give me a call, or send me an e-mail! Change is inevitable. Some fear change, and others embrace it. But the changes that are going on right now, are looked forward to every year, and give a clue to what is in the future. Of course I am talking about wine, but it's not wine yet. Yes, the grapes in the vineyard reaching that point in their annual lifecycle (see budbreak and flowering) , where they go through a process known as veraison. Last week, I started receiving the first reports of versaison occurring in the vineyards. So what is veraison, and why should we even care about it? In simple terms, veraison is the point in a grapes' life cycle where it changes from little hard green "pebbles" to larger, colored plump berries. At the beginning of veraison, the grape berries are hard, green, and acidic, and are around half their ultimate harvest size. 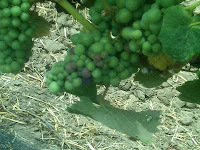 At veraison, the grape berries start to soften. The acid in the grapes reduces, and is joined by fructose and glucose (sugars). 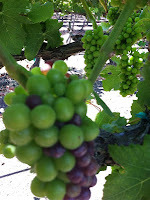 Depending on the grape variety, the chlorophyll green color changes to red/black or yellow/green. 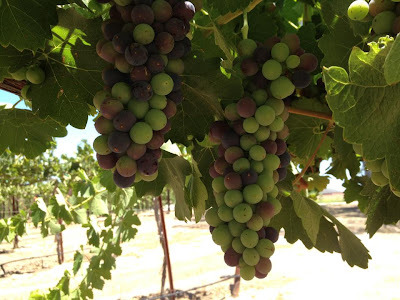 Each grape variety goes through veraison at different times, but even the same grape variety will begin the change at different times both in the vineyard, and the individual cluster. The first grapes to change are those that are exposed to warmer microclimates. This can be due to sun exposure, and aspect in the vineyard. The leaf canopy, and how the grower prunes the canopy can affect the time of conversion. 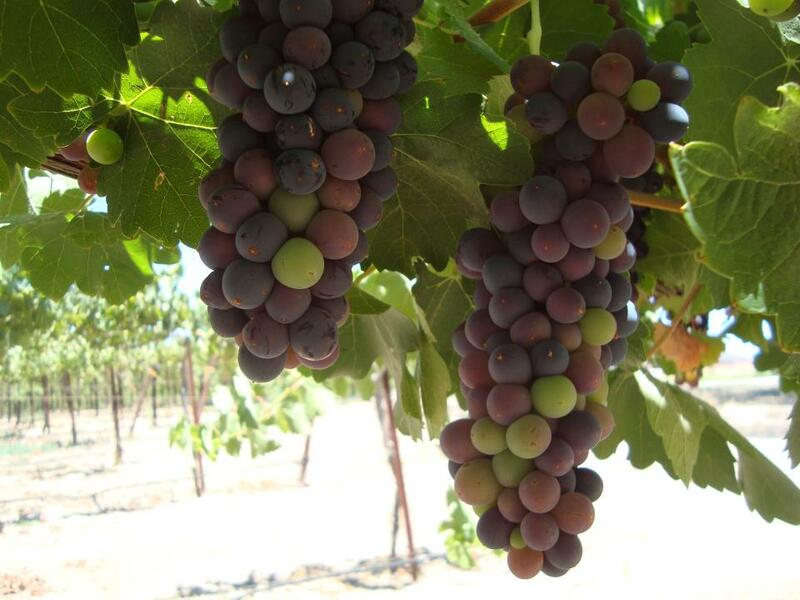 It is also interesting to note that those growers who thin the grape clusters (reducing the size of the crop) see veraison occur earlier. Lower yields typically produces higher quality grapes. 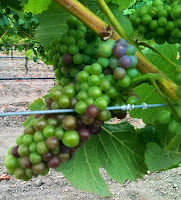 Early veraison, may be an indication of higher quality. The key words in that last sentence is "may be". 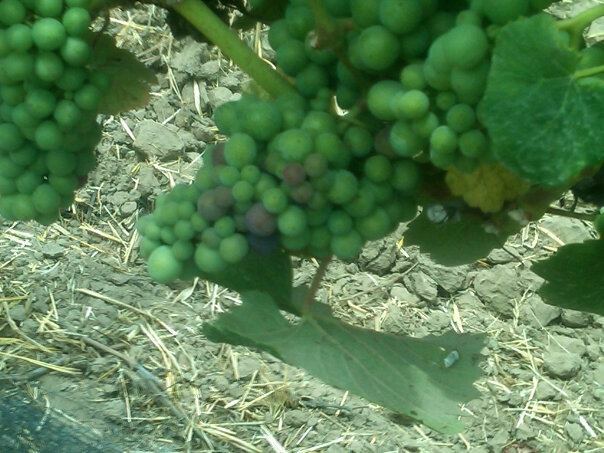 If it is true, then there might be a rush to announce veraison in the vineyard. So, we are at the beginning of the end for this years harvest. In about eight to ten weeks, the growers will be watching the brix levels (sugar in the grapes) and watching the weather to determine when to harvest, and ultimately make the best wine out of this years harvest. This week, the Arrowhead Wine Enthusiasts will be holding an Italian wine tasting. Every time I present wines from a certain region of the world, I try to find representative varieties, that are typical for that region. When I was studying for my level III Sommelier certification, Italy was described as a "mosaic". A vast country with a lack of unity and huge quantities of wine. The Greeks brought grapes to Italy, and wine has been made for over 2800 years. The challenge with Italy is that everyone knows Chianti, Barolo, Soave and Prosecco. But, Italy's Ministry of Agriculture and Forestry has documented 400 grapes and granted them "authorized" status. There are more than 500 other documented varieties, but the total number of grape varieties is thought to exceed 2000. This is the land of grapevines, and the country for wine lovers who want to try something "new". For this reason, I chose five wines for the group to taste, and I will guess that most have not tasted, much less heard, of the grape varieties I will be serving (other than Lagrein, which we are starting to see plantings of, in California). Italy's white wines are much lesser known than her bold, red cousins. They are light, delicious and affordable. Italian white wines have a character all of their own. Crisp, soft, and highly acidic, they are made to accompany food, not overpower it. 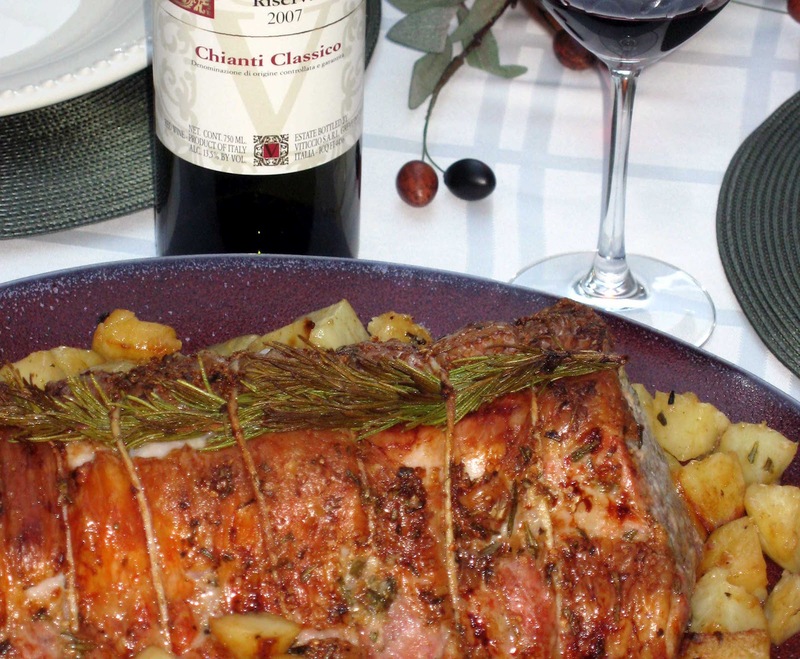 Italy is a country based on food and wine culture. Wine is not meant for sipping on its' own...it is meant for food. Verdicchio (verh DEE Key o) - Produced in eastern Italy, near the Adriatic coast, in the Marche region. The name comes from "verde" (green). The white wines are light and dry, and are noted for their high acidity with hints of fresh apple and lemon as well as a characteristic nutty flavor with a hint of honey, in other words, not very aromatic. 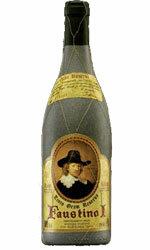 Unlike most Italian white wines, it is capable of aging, but it has a fruity freshness when drunk young. Relatively inexpensive, this wine is perfect with seafood and fish. Kerner - An aromatic white variety. It was bred in 1929 by August Herold by crossing Trollinger (a red variety known as Schiava in Italy) and Riesling. 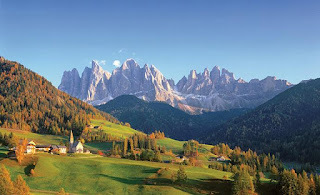 Kerner is most commonly planted in the German regions, but also found in the Italian province of South Tyrol (or Südtirol). Kerner produces something similar to a lightly perfumed Riesling. Lagrein (lah-GRYNE) - An historic variety from the Trentino-Alto Adige, where it makes plum and cherry perfumed, medium-bodied reds and light roses, as well as some rich, dark red wine, that aren't very tannic. Due to the low tannins, and dark fruit, Lagrein is an easy drinking, satisfying red wine. Monica - Originally known as Morillo, Monica is a red wine grape that is grown primarily in Sardinia. Wines produced from 100% Monica are typically light wines with the flavor of cherries and cranberries, but most Monica wines are blended with Carignano and Bovale. 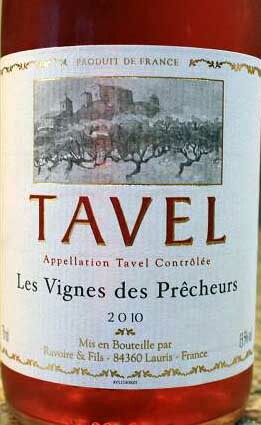 It is a low tannin, low acid grape, that may be related to California's "first grape": Mission (or Pais). Carignano (cahr-e-NYAWN-o) - A red wine grape that may have originated in Cariñena, Aragon and was later transplanted to Sardinia, Italy. It is often used as a deep coloring component in blends, rather than being made in a single variety form. The grape is difficult for winemakers to work with since it is naturally high in acidity, tannins and astringency. Bovale Sardo (Bo-VALL-eh SAHR-doe) - A smaller berried red grape that tends to produce acidic wine that is lacking fruit components. 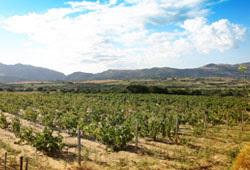 Found primarily on the island of Sardinia where it used mainly for blending. Sagrantino (sag-rahn-TEE-noh) - A native to Perugia, in Umbria, this variety is fairly limited in its production zone (only planted on 250 hectares). 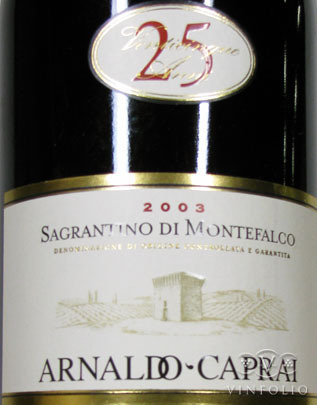 It makes dark, intense, ageworthy red called Montefalco Sagrantino. Inky purple, with cherry and smoke flavors, and heavy tannins, these wines can age for many years. Some of the finest Passito wines (made from dried grapes) come from the Sagrantino grape. A little story about Arnaldo Caprai...a number of years back, I had the opportunity to have dinner with the daughter of the winemaker at Arnaldo Caprai. At the end of the evening, I purchased some of the wines, and held on to them. On the day I received my Sommelier Certification, the bottle I brought with me for the ceremony was an Arnaldo Caprai Passito Sagrantino. A wonderful wine, and a wonderful memory. I think the wines for this tasting will all showcase the different regions and different grapes of Italy. I am looking forward to the response from those attending the tasting, and hope some of them will add their comments to this blog, after the tasting. The process of putting this meal together started a couple months in advance. The host couple, worked up some suggested menu items, and assigned each of the other couples one of the dinner courses. All the recipes came from the Tuscany Region of Italy, and were as authentic as we could find. As the Sommelier in the group, it was also my job to pair the wines for the meal. I reviewed each recipe, and determined which wines might work best with each course. Some of the wines were harder to find than others. 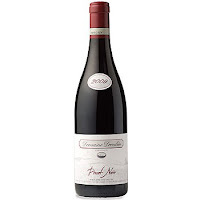 The Pomino was one of the challenging wines, but I found it online, and placed my order well in advance. What follows is a recap of the Tuscany dinner and wine evening. When we arrived at our friends house, the outdoor table was decorated with olive branches, and a canopy of lights were strung above our heads. The official colors of Italy were well integrated into the table settings. The summer evening was perfect for a Tuscan dinner. Italian music was playing in the background, and their menu "pig" board gave us the menu for the evening. We were about to experience a 4-course dinner with a progression of wines to match. During the entire meal, we had homemade cheese bread sticks and focaccia. The first course (or antipasti) of the evening was Involtini di Breasaola, Ricotta e Rucola, translated to sliced cured beef with ricotta cheese and arugula. To this I paired a dry sparkling rose: Secco Italian Bubbles. There was a slight lemon zest flavor to the cheese filling, and faint sweetness from the addition of Marscapone. Breasaola is a cured beef that is similar in texture to Proscuitto, but without the same saltiness. The pairing with the Secco worked beautifully. 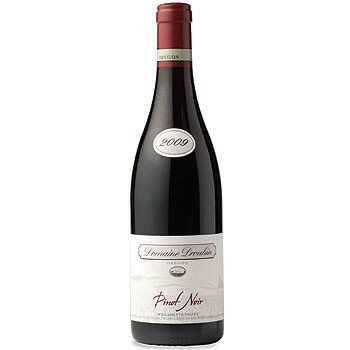 The Secco was made from the Raboso Piave grape, and a bit of Pinot Noir. Only the slightest bit of sweetness, nice acidity, and some cleansing bubbles for the cheese. Our second course, and my assigned recipe for the evening, was Lasagne con Funghi, or Mushroom Lasagne. I paired this with a Frescobaldi Pomino Bianco Riserva 2008. Now, since this was the course I was in charge of, it was a good thing I had a couple months to plan. One of the ingredients is Nepitella (an herb I was not familiar with). I ordered some plants (from outside the country) had them shipped, and planted them with the sole purpose of using them in my mushroom mixture. The taste of nepitella is something between mint and oregano in flavor. To keep everything authentic, I made my own lasagne noodles (what a pain, but definitely worth it for the more delicate texture versus dry store bought noodles). I also rediscovered the costs of crimini and porcini mushrooms, but there is no substitute for the wild mushroom flavors and aromas. The pairings of Pomino Bianco was great. This is a Chardonnay, that has seen oak, and some MLF, offering up some mushroomy aromas of its' own. It really worked well with the lasagne. I will definitely do this one again! Our third course was Arista e Torta di Erbe Pontremolese, translated as Roasted Pork Loin and Green Vegetable Tart. To this we paired Fattoria Viticcio Chianti Classico Riserva 2007 (opened up and decanted about two hours in advance). The Roasted pork loin was a special cut, that our local butcher prepared for the dinner. The roast was covered in a paste of garlic and rosemary, then roasted in the oven, with a sprig of rosemary attached. Pan-roasted garlic and rosemary potatoes were also added. The Vegetable Tart was made with Swiss chard, endive, leeks, ricotta and Parmesan Cheese. All this made for a spectacular presentation of the main course. The decanted Chianti mellowed a bit, and worked wonderfully with all the mix of flavors presented on the plate before us. 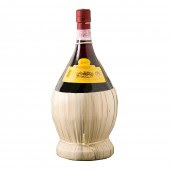 This wine was picked as the top Chianti in the Wine Spectators top 100 list from 2010. What a great value. We ended the evening in traditional Tuscany style...with Cantucci, roasted figs with honey, and Villa Vetrice Vin Santo 1990. The Cantucci are basically almond biscotti. Ours were homemade, and the perfect size for dipping into our aged Vin Santo wine. The oxidised/carmelized, sweet flavors of the Vin Santo worked nicely with the figs and the cantucci. If I did it over again, I might go with a bit younger Vin Santo, as this one was pretty oxidized...but still nice. So, we didn't visit Tuscany, but our dinner, got us as close to it as we could, while still staying in California. Hopefully this will inspire you to try your own themed dinner experience. If you would like recipes, or pairing advice, just add your comments below.